A good night for the networks. CW: SUPERGIRL aired for the first time since December 4, and it gained 0.1 to 0.6. VALOR held at 0.2. FOX: The 2-hour season finale of THE GIFTED rose 0.3 from its last airing on New Year’s Day to 1.0. 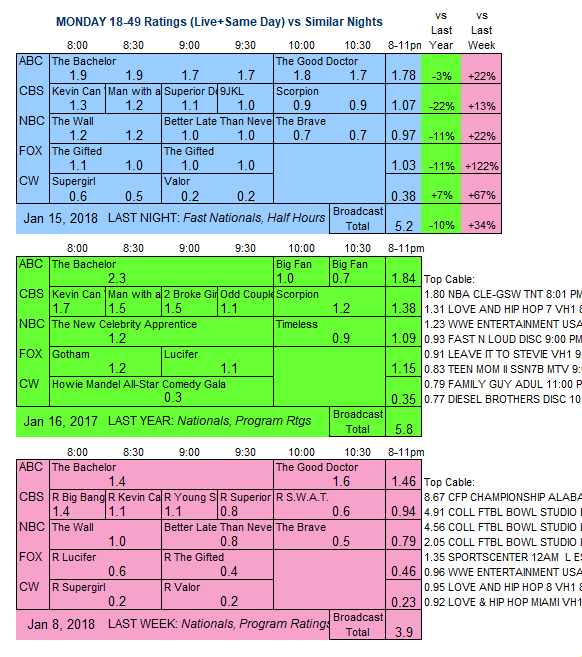 CBS: The line-up aired for the first time since December 18, with positive results. KEVIN CAN WAIT rose 0.2 to 1.3, while MAN WITH A PLAN (1.2), SUPERIOR DONUTS (1.1) and 9JKL (1.0) were all up 0.3. SCORPION climbed 0.1 to 0.9. 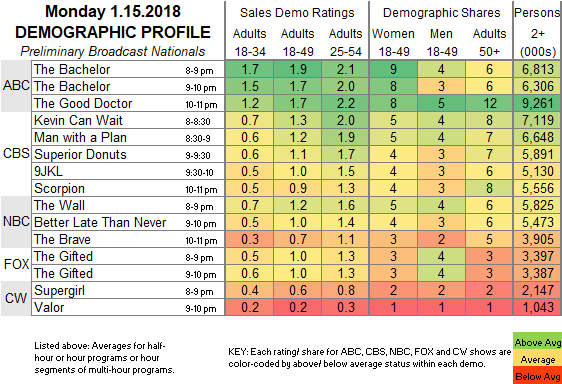 ABC: THE BACHELOR jumped 0.4 to 1.8, and THE GOOD DOCTOR was up 0.1 to 1.7. NBC: THE WALL (1.2), BETTER LATE THAN NEVER (1.0), and THE BRAVE (0.7) were each up 0.2. CW’s BLACK LIGHTNING makes its debut tonight after the midseason premiere of THE FLASH. CABLE RATINGS: Come back Wednesday afternoon for detailed demographic ratings for top Monday cable programs, later than usual due to the MLK holiday.